Q: I'm interested in to buy the product of yours: deluxe-menu. But I've got a dude. A: Actually you are able to paste any html code within items. Q: Can data be loaded dynamically? For example, can your dhtml menu source code load the child of a node once the node is clicked on? A: You can use AJAX like technology. You may generate a menu from a database or XML using any server-side script, e.g., PHP, ASP, VB, etc. Q: Thanks for getting back with me but how do you build the menu? I opened Deluxe Tuner program to build a menu and there are categories titled common, dimensions, font, appearance etc. and I have NO IDEA what to do? Can you walk me through the development of a menu? A: First of all you should add items. Please, click "Add item" and "Add subitem". In the "Item parameters" window you can set text, link, target, iconsfor the menu items. You can also assign different style for each menuitem (item style and submenu style). But at first you should create this style. Click "Edit IndividualStyle/Add Style" and set different parameters for the style. 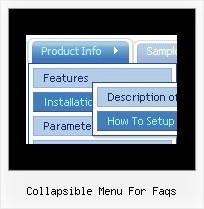 Try to set different parameters of the menu. In the "Preview window" you can see all your changes. var isHorizontal = 1; Menu orientation: 0 - vertical, 1 - horizontal. You can set exact width and height of the menu in the "Dimension"category. if you want to have absolute positioning menu. Font style you can set in the "Font" category. You can also try to change any template. Docs, Examples, Samples, FAQ (updated)... by John » Thu Oct 30, ... Milonic + Collapsible Menu - removing words "Milonic"?